Apparently the Internal Revenue Service wants to lower the casino tax-withholding level from $1,200 down to $600. This means that whenever a player hits the $600 mark on any slot machines, it will lock up until the proper tax forms are filled out. It is a very ludicrous proposal by the IRS, seeing as how many players hit that mark when playing consistently. Eric Schippers, senior vice president of public affairs with Penn National Gaming Inc. and Geoff Freeman, president and chief executive officer of the national trade group representing the casino industry, American Gaming Association, both agreed that it would be wiser to raise the level, not lower it. Taking inflation into consideration, this 10 year old threshold would be much better off getting raised. 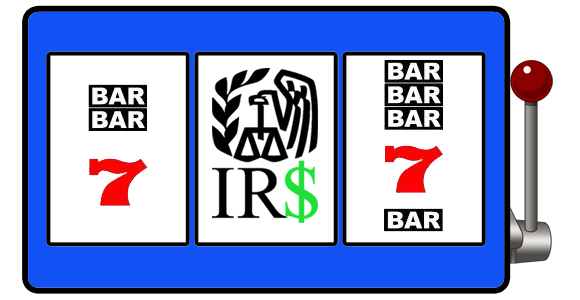 In the end, if players are getting hindered when playing, they won’t be as apt to play at the slot machines, and most probably hurt the casino’s profits, as well as lower the amount of taxes the IRS gets from these games. All in all, the IRS should consider reversing their proposal, and actually increase the tax threshold, or all parties involved may leave bitter. This may be limited to certain areas, but it could expand at a national level, so always be cautious!